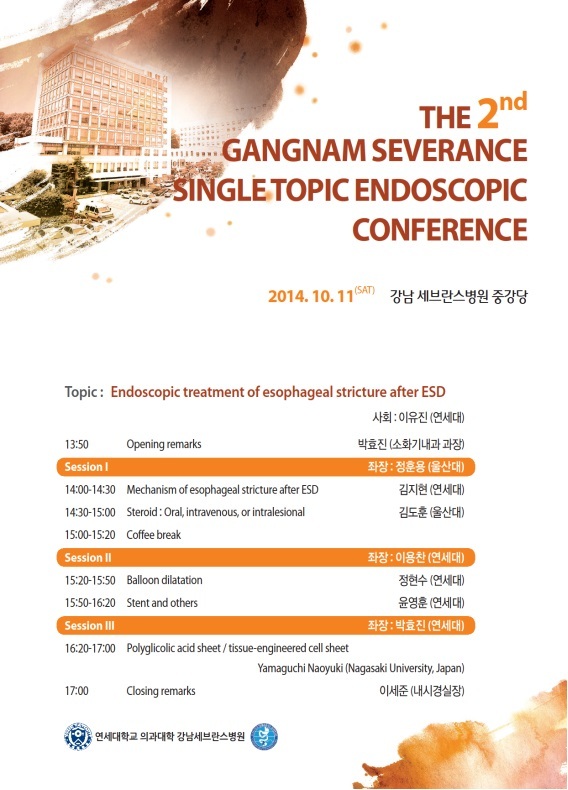 강남세브란스병원 박효진 과장님 주도로 작년부터 Gangnam Severance Single Topic Endoscopic Conference (GSTEC)가 진행되고 있습니다. 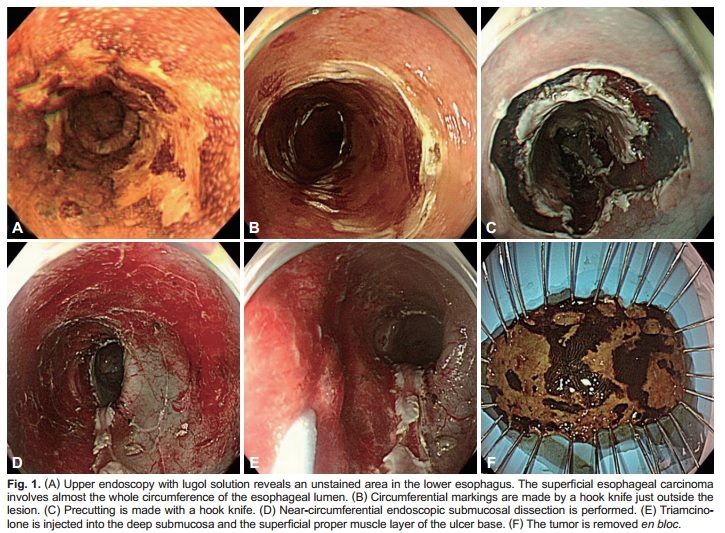 작년은 '내시경 리노베이션 세미나'였고 올해의 주제는 'Endoscopic treatment of esophageal stricture after ESD'였습니다. 사실 너무 specific한 주제인지라 반나절 심포지움이 잘 진행될까 살짝 걱정되었습니다. 그러나 막상 심포지엄에 참석해보니 내용이 깊고 풍부하여 놀랐습니다. 참 많이 배웠습니다. 큰 돈을 들여 며칠간 해외 학회에 나간 것보다 많이 배웠다고 느꼈습니다. 잘 준비해 주신 여러 선생님들께 감사말씀 드립니다. 최근들어 식도 ESD후 협착의 빈도가 감소되고 있다. 2011년 이전에는 9%정도였으나 2012년 이후에는 2% 수준이다. 다양한 예방전략이 사용되기 때문이다. 따라서 협착을 줄이기 위해서는 초기의 염증을 줄여야 한다. 금식, cautery effect를 줄임, 스테로이드 사용 등 전략을 고려할 수 있다. 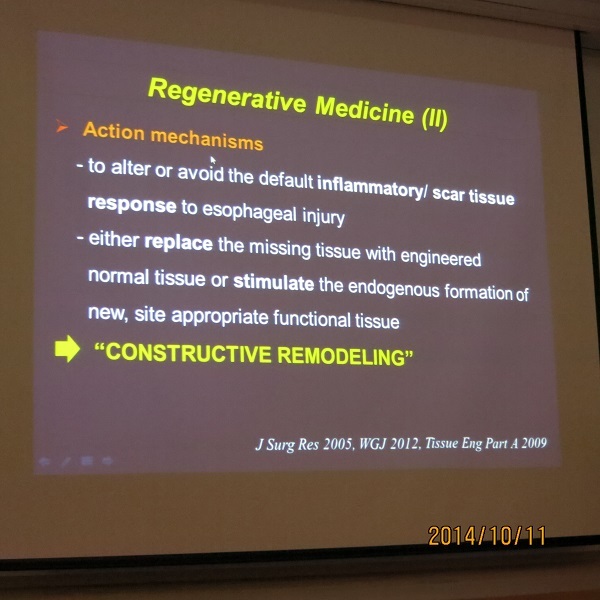 Myofibroblastic cell layer가 협착의 주범이다. 스테로이드는 이 층의 변화를 가져온다. Preemptive balloon dilatation (2/week for 8 weeks, 점막이 완전히 healing 될 때까지) 일부 효과가 있는 듯 하지만 oral steroid 보다는 못함. 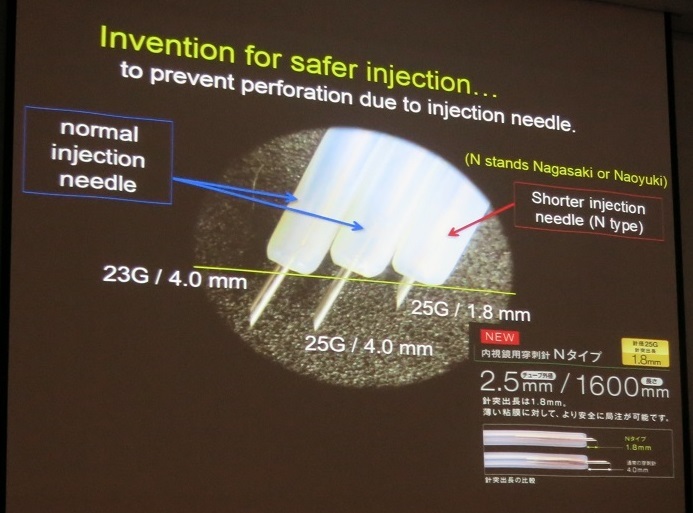 3) 연자의 결론: Oral prednisolone, often combined with early balloon dilation, offers the sole validated and affordable treatment option. 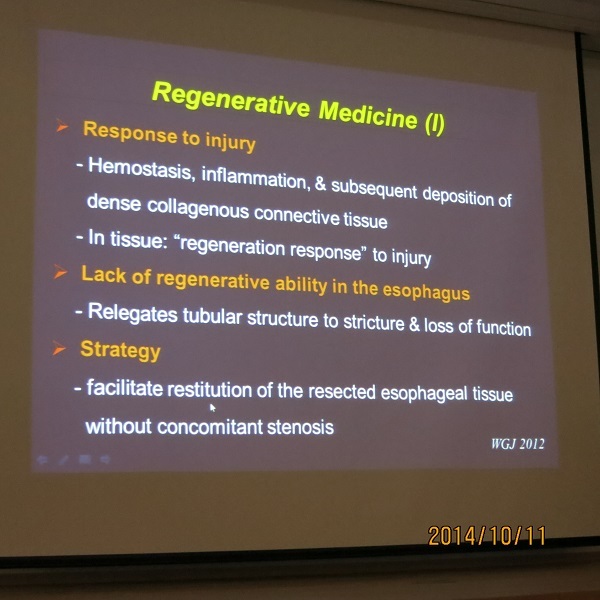 - Benign stenosis에서 스탠트를 잘 사용하지 않는 것음 migration, hyperplatic tissue reaction, embedding into esophageal wall, new stricture formation, perforation, fistula formation 등의 우려가 있기 때문임. - 35번 풍선확장술로도 호전되지 않았는데 stent를 한 후 좋아졌다는 일본 증례가 있음. - Mytomycin C local injection or local application (MMC를 적신 cotton pledget을 3-5분 정도 접촉시키는 방법)도 promising 해 보임. 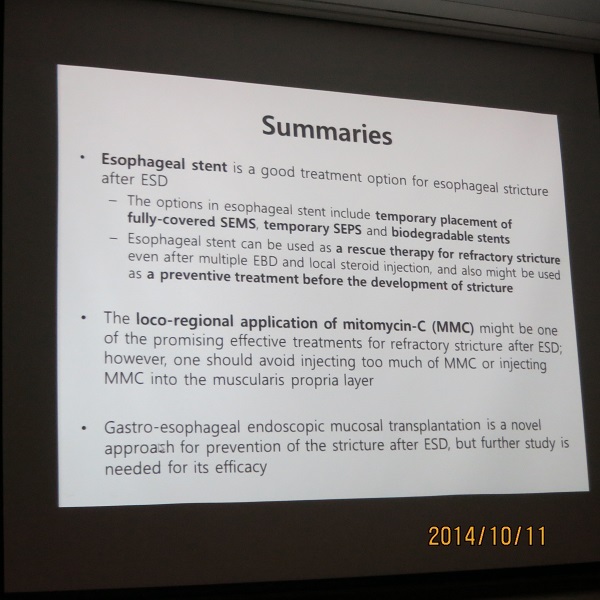 - 5-FU, N-acetylcysteine, amniotic membrane graft, gastroesoohageal endoscopic mucosal transplant, 등을 시도한 연구가 있음. 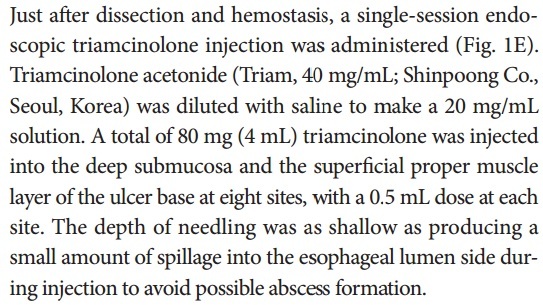 Triamcinolone injection immediately after ESD: 이를 위하여 매우 짧은 내시경 주사침을 개발하였음. Semicircular case에서는 triamcinolone injection immediately after ESD와 oral steroid의 효과가 비슷하지만 complete circular case에서는 oral steroid treatment가 더 효과적임. 이러한 결과를 바탕으로 Yamaguchi 교수님은 아래와 같은 알고리즘을 보여주었음. Yamaguchi 교수님의 새로운 방법을 두 가지 소개하셨습니다. 이번 심포지엄 참석자들이 가장 흥미롭게 생각한 주제였습니다. EndoTODAY에서는 제목만 소개합니다. 1) Cell sheet transplantation with a transfer is the world's first attempt in the digestive area. 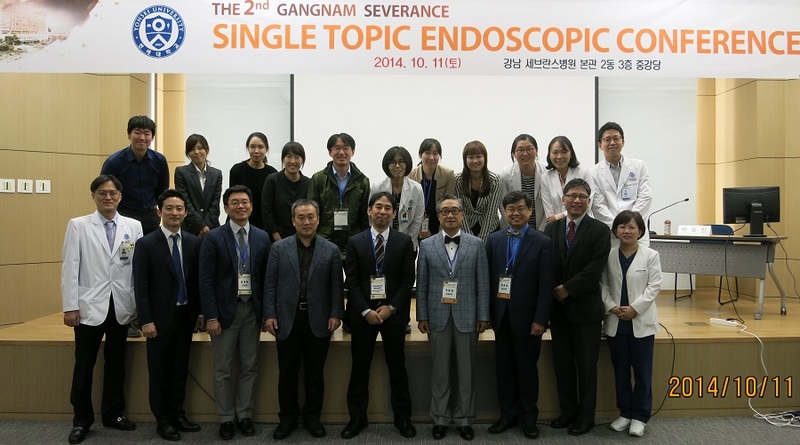 식도 ESD 후 협착우려가 있으면 ESD 직후 intralesional triamcinolone injection이나 8-12주 oral steroid therapy를 시행하는 것이 좋겠음. 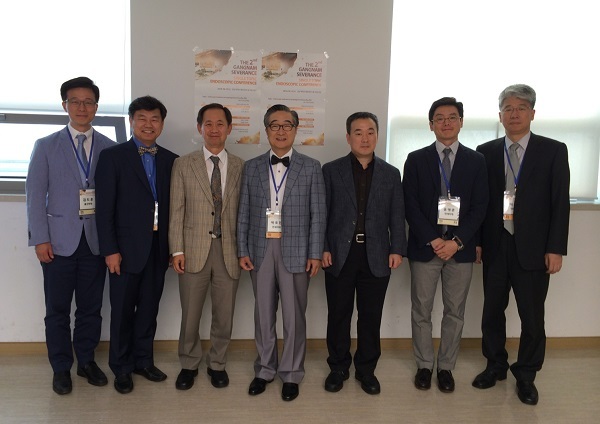 Semicircular인 경우는 둘 중 하나를 선택할 수 있지만 circumferential한 경우에는 oral steroid therapy를 선택하는 것이 합리적으로 생각됨. 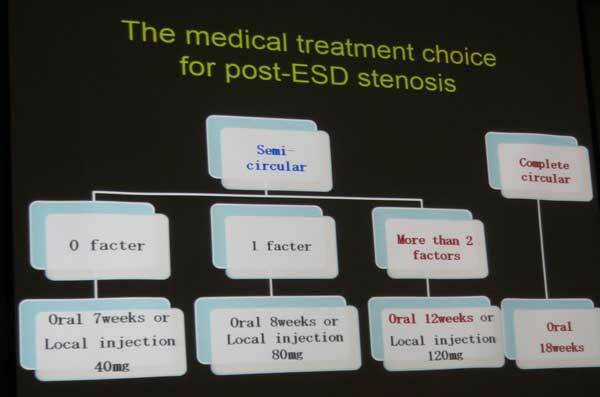 경구 steroid 8주 치료의 표준 protocol: ESD 2-3일째 30mg으로 시작한 후 매주 30, 30, 25, 25, 20, 15, 10, 5로 천천히 줄여나감. 'ESD 3일 후부터 반복해서 intralesional triamcinolon injection을 하는 방법'이나 'preemptive balloon dilatation 방법'은 우리나라 현실에 너무 번거로울 것으로 생각됨. Mitomycin C local application이 유망해 보임. 아직 데이타가 필요함. 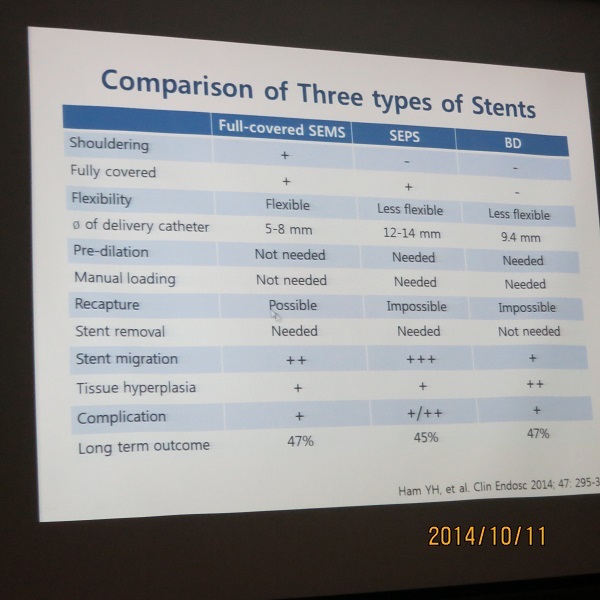 Cell sheet transplantation과 PGA felt + fibrin glue 법은 근사하지만 현실적으로는 사용하기 어려움.